Fiona Walker. If you don’t know her by name, you’ll probably know her pert posterior. In her youth Fiona was photographed in tennis gear for what became one of the most iconic photographs of the 1970s, showing a little more cheek than one was accustomed to at the All England Lawn Tennis Club. Fast forward a decade and Fiona’s bum was a familiar sight for many a teenage lad on a Saturday, browsing through the poster displays in Athena. In fact, typically the only thing that distracted this young car geek away from Ms Walker’s rump was an even more alluring image of an Italian supercar. The masses of gills, vents, creases, spoilers and scissor action doors grabbed my attention to an even greater degree. If I left the premises having parted with money, it was a Countach that graced my bedroom wall that afternoon and not young Fiona. 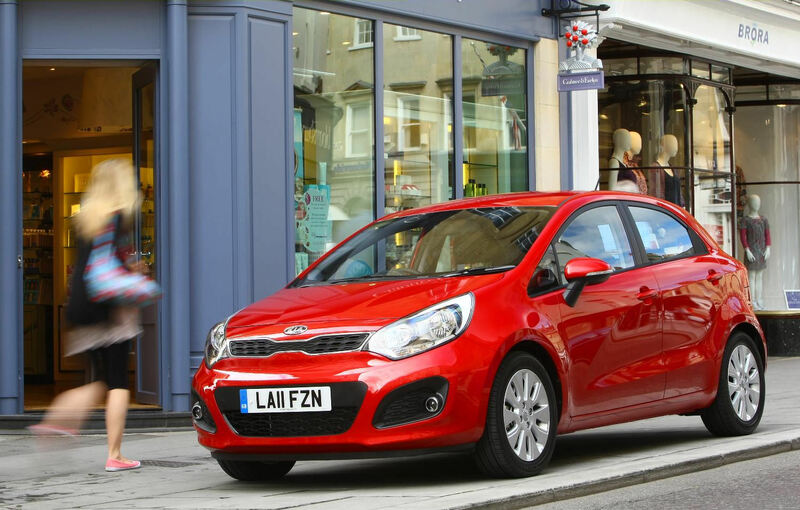 Distinctive cars were on my mind last Wednesday afternoon when I went out to familiarise myself with the latest Kia Rio. Every car I review begins with excited anticipation as I stride across the car park to find where the delivery driver has left that week’s steed. Usually this is a quick and easy process as the unfamiliar metal is easy to spot amongst the regulars but last Wednesday was different. For over five minutes I wandered around before I eventually spotted it – and only then because I was locking and unlocking with the key fob and caught sight of flashing amber lights in my peripheral vision. Considering the boldness of Kia’s more recent offerings and the advance this third generation of Rio is over its predecessors, its inconspicuousness both surprised and disappointed. It’s not a bad-looking car by any stretch and any styling awkwardness that versions one and two of the Rio suffered has been thankfully banished. But in the process Kia’s stylists have also eschewed boldness; for a marque that’s really going places across Western Europe with sales soaring as customers embrace the daring creases and shapes of the Soul and Sportage, the Rio feels like a retrograde step. In isolation, it seems to have all the right ingredients: a further evolution of the corporate ‘tiger nose’ grille, a shallow glass house, delicate body side creasing and a tidy rear, almost as pert as Fiona’s. These disappear in proximity to other cars because there are familiar styling themes found on other brands’ models. The bonnet to windscreen angle, with stalk mounted mirrors just after it, hints at recent Vauxhalls, as does the shapely pressing on the doors. The narrowing window line is reminiscent of Audi’s A3 and that sheer tail smacks of the original SEAT Leon. These elements do blend well together but this is Kia being derivative and not progressive. How many familiar styling elements can you see? There’s a logic at play here that isn’t immediately obvious. Since its launch, the Rio line has typically been the weakest link in the Korean manufacturer’s range but it remained popular with a core group of customers who wanted a spacious small car for little outlay and for whom image was not a primary concern. Kia’s task has been to produce a new supermini that generates conquest sales without scaring off the faithful with styling that’s too radical to stomach. Keeping the Rio name further helps with the transition, illustrating that even the less celebrated of nameplates have brand value too. 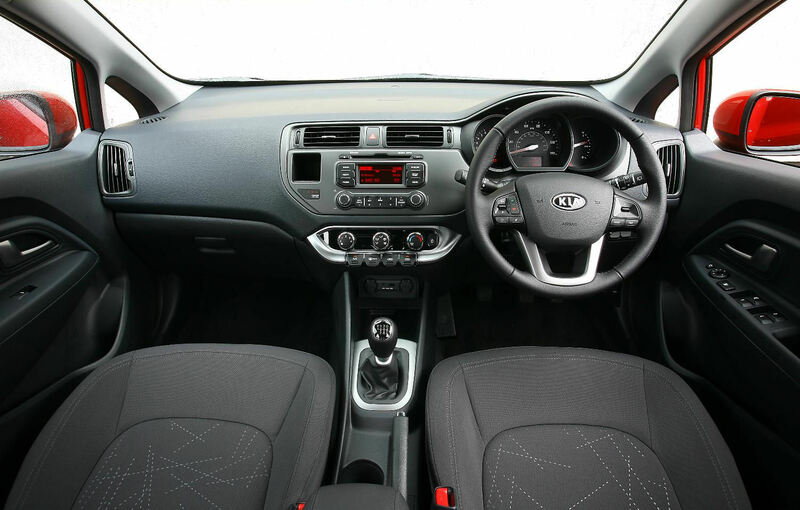 So, the Kia Rio’s exterior a little on the bland side – has the interior enjoyed a flair injection? Open the doors to the Rio’s cabin and two things immediately strike you: it’s a sombre, plasticky place to spend time but one that’s well screwed together. Evidence abounds in the form of the hard, black mouldings that the Rio’s built down to a cost but there’s a solidity there that just edges the Fabia I tested recently; doors close with a thunk, rather than a tinny slam. The front seats, whilst not trimmed in the most glamorous of textiles, are amongst the most comfortable I’ve enjoyed, not just in a small hatchback but in any car full stop. A 400 mile round trip down to the south coast and back left me feeling fresh and free of fatigue; their well-bolstered shape and grippy upholstery keeping you snugly in place. Less joyous is the uninspiring dashboard design that you’re faced with. With the rake of the windscreen as it is, there’s an ocean of shapeless dark plastic running forwards to the glass from the facia with little attempt to offer visual or tactile relief. The instruments are set within a trio of pods, with the majority of switchgear controls placed in a horizontal plane. The only areas of flair in this otherwise insipid interior are a bank of four toggle switches at the bottom of the dash and a smattering of gloss black finish around the air conditioning controls. What it lacks in quality of materials, the Rio more than makes up for in the quality of its build. Not the merest hint of a trim rattle or moulding squeak anywhere suggesting that it’ll still be solid and reliable well past Kia’s 7-year warranty period. 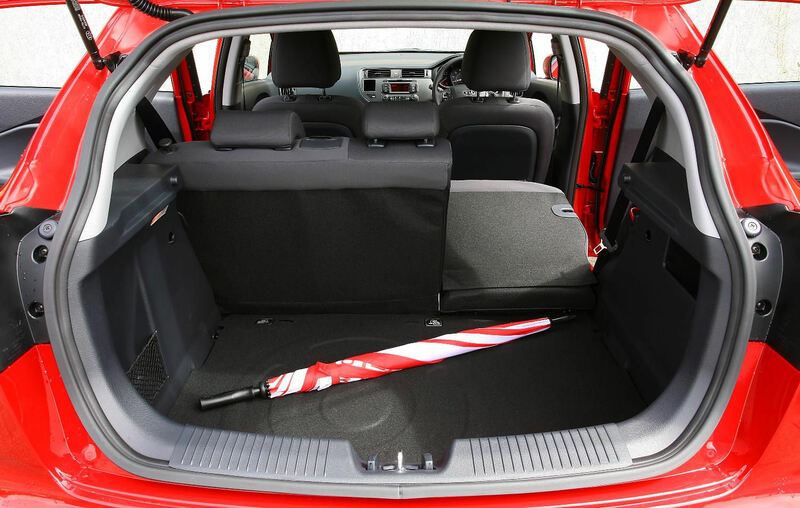 Move into the back and it’s typical of most contemporary small hatchbacks of this size (as an aside, a small hatchback these days is not especially small, just nudging over four metres in length), with decent space for two adults (or two child seats). Unless you’ve got hips slim enough to slide yourself through a basketball hoop the middle perch is best left alone, even though there’s a regular three-point seatbelt and adjustable headrest provided. Naturally, ISOFIX mountings are offered for child restraints in the outer seating positions, along with a full set of airbags and other safety measures as standard that cement the Rio’s 5-star Euro NCAP rating. So, is the Rio grand? This particular Rio was a mid-spec ‘2’ specification, slotting conveniently between the base ‘1’ and flagship ‘3’ versions. 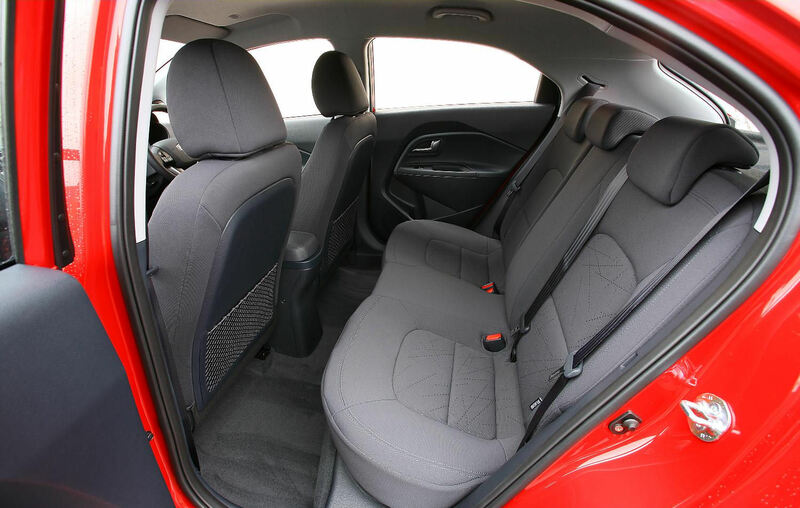 In ‘2’ form the Kia’s reasonably well equipped but if you can stretch by another £700 to the top of the range models, the wealth of ‘big car’ equipment will take your mind off the blandness of the interior. 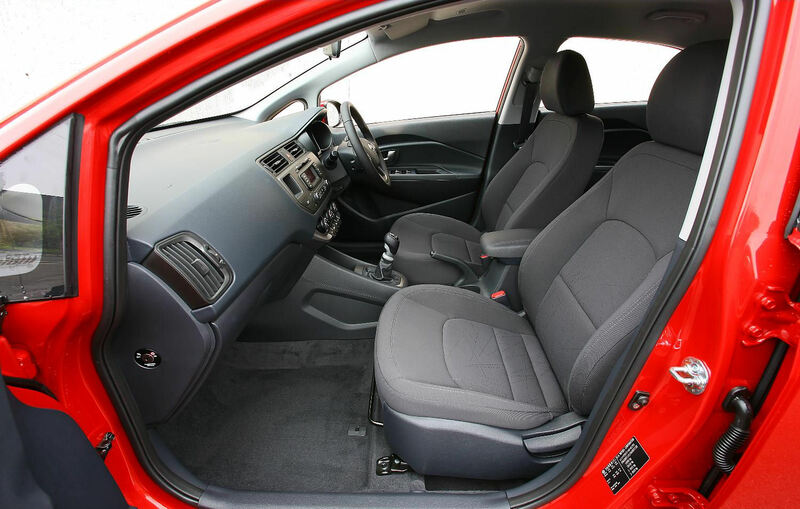 Standard features on the ‘2’ include 16” alloy wheels, air conditioning, all round electric windows, electrically operated and folding rear view mirrors, a reasonably good quality stereo with Bluetooth connectivity for both phone and audio, leather trimmed wheel and gearknob. 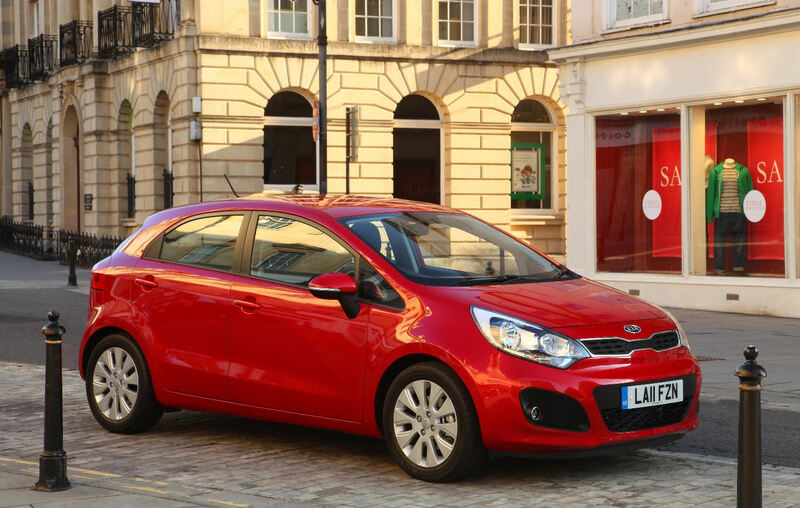 Currently, the Rio is only available as a 5-door hatch, with a 3-door version being introduced later in 2012. 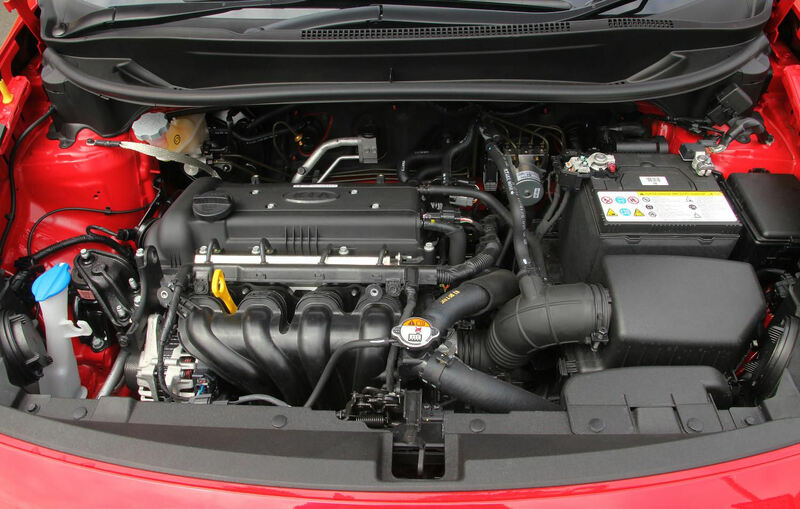 Two petrol engines are on offer – a 1.25 model complements the 1.4 on test here. More focus has gone the way of the common rail diesels, with a three-cylinder 1.1 and a four-cylinder 1.4 on offer, the smaller of which boasts of a remarkable 88.3mpg on the combined cycle. Diesel versions also feature Kia’s EcoDynamics stop-and-go functionality, further reducing its thirst for fuel, whilst the 1.4 petrol can be specified with an automatic gearbox in ‘2’ specification. 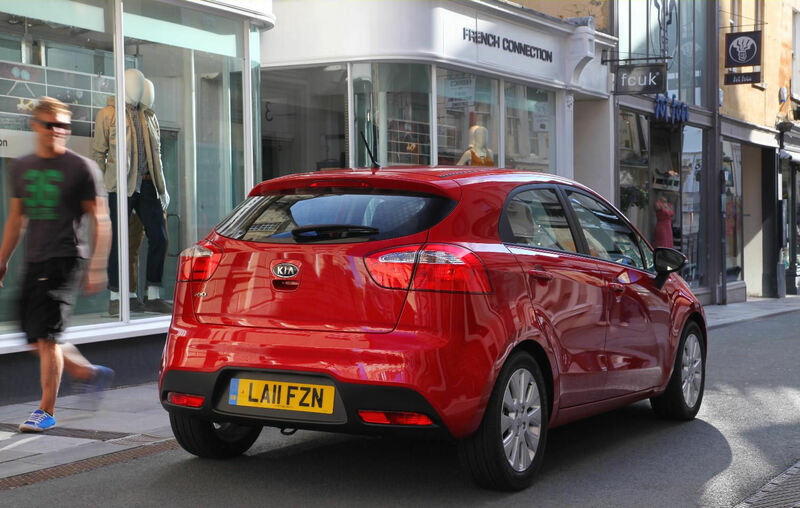 Rios start at £10,595 for the ‘1’ 1.25 up to the ‘3’ 1.4 CRDi EcoDynamics at £14,895. 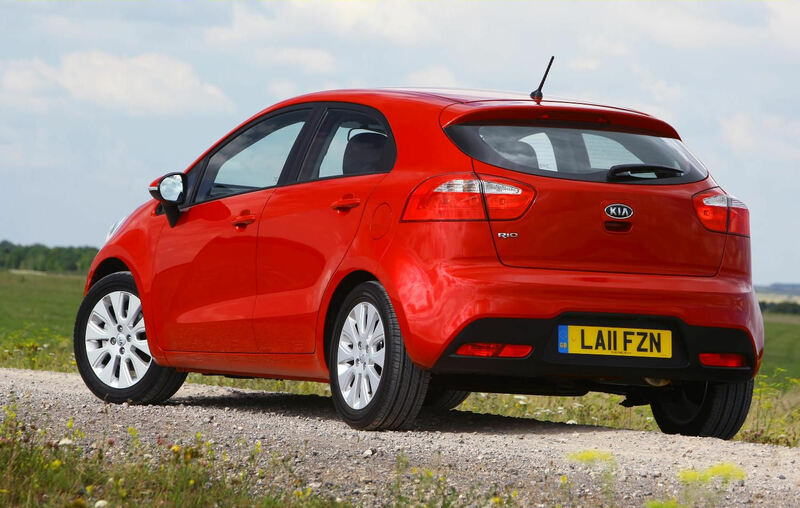 What’s the third generation Kia Rio like on the road? Kia’s focused the latest Rio to make it particularly well suited to urban driving and in 1.4-litre petrol guise it performs with poise. The four-cylinder engine is refined and very smooth, emitting a sweet thrum below 3000rpm where the majority of its torque is delivered. That low down responsiveness aids progress between traffic lights and stop signs, ensuring that off the line the Rio zips off with eagerness, although the on paper quote of 11.1 seconds to reach 60mph doesn’t sound like it’s worth writing home about. Steering is somewhat limited in terms of ultimate feel but thankfully isn’t over-assisted, offering a reassuring amount of resistance as it’s twirled yet it’s still easy enough to manoeuvre painlessly around built-up areas. Conversely, the pedals are light as is the gearshift, which offers easy flicking between the ratios and easily trundles along without complaint in sixth at 30mph. Most impressive is the composed and mature ride quality, offering a genuinely comfortable experience, soaking up all manner of ruts and potholes with an accomplished control of bump absorption. 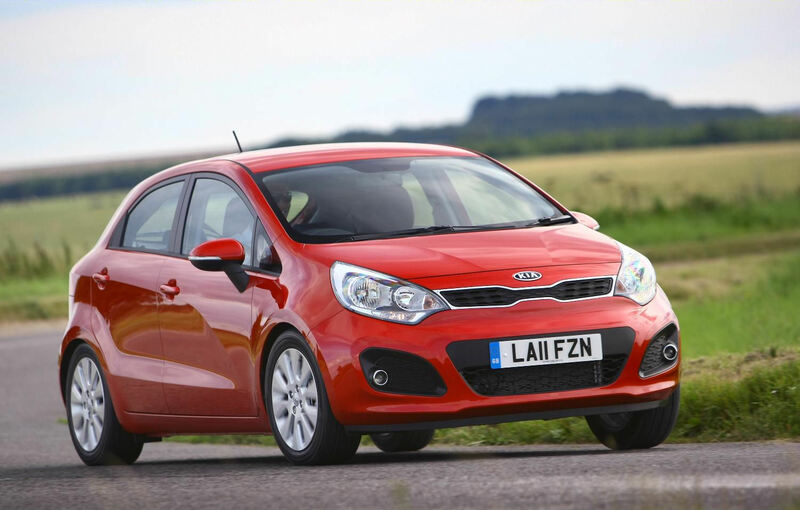 Other manufacturers would be well-served studying the Rio’s suspension setup to understand how Kia’s ironed out that stereotypical small car ‘bounce’. Explore further afield and the Rio’s city-centric ethos becomes more apparent. Once you’ve coaxed it up to cruising speed it remains impressively stable and composed, nipping in and out of motorway traffic in a manner that raised a smile as many a sports car can be kept fairly honest. It’s getting to those multi-carriageway speeds that takes some work. Keeping it in top gear and mating the accelerator pedal with the bulkhead carpet will get you there eventually but the lack of top-end grunt makes it feel tediously slow. Dropping a cog or two doesn’t offer a great deal more go either and unfortunately bins the engine’s sweet revving tune for a strained din. Venture into the countryside to sample roads of a more winding nature and the Rio becomes very ordinary, offering little fun and progressive understeer if you press on with too much vigour. The latest Rio isn’t a ground breaking small car by any stretch but it’s a leap forward from its predecessors and will undoubtedly encourage newbies into Kia showrooms. Once there, they’ll discover a very competent small hatchback that’s well-built and performs sweetly around town. If they’re going expecting the Rio to have been blessed with the same styling joie de vivre as other new additions to the line-up, they’ll be disappointed though. The Rio’s pleasant, inoffensive and, well, nice. Just not particularly interesting or bold. This isn’t necessarily a deal breaker for reasons discussed earlier because as a safe, reliable and comfortable urban hatch, the Kia will perform faultlessly all day, every day for years. If you’re looking for a small hatchback, this should be on your shortlist. The fact that the Rio can now be compared on an equal footing with the likes of SEAT’s Ibiza and its Škoda Fabia cousin is further evidence of how far the Korean brand has come in just the past decade. And like the Volkswagen Group pair, the basic credentials are there for Kia to take the next step and produce a Rio with sportier aspirations. Tightening the suspension, dialling in more feel through the wheel and pedals, turbocharging the 1.4 petrol engine, fitting bigger wheels and a subtly muscular body kit would be a relatively simple and cost effective transformation for Kia. After all, Rio’s supposed to be hot.